December is traditionally the least active real estate month of the year, as folks take a step back to enjoy the holiday season. Although we saw the expected slowdown in number of deals, the month had respectable totals showing that many buyers and sellers had happy holidays. 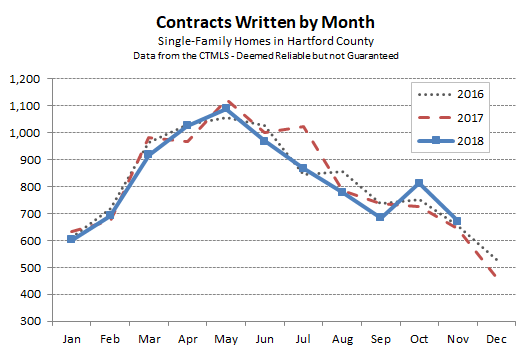 When looking at contracts, the month was nearly 15% ahead of last December for single-family homes in Hartford County. We finished the year with about 1.3% fewer contracts in 2018 than in 2017. At the big picture level this was all very positive – the local real estate market remained near peak levels of activity for the 3rd consecutive year. A key story throughout 2018 was listing inventory. We noted regularly that there were few homes for buyers to choose from in the most popular price points, which was potentially holding back sales totals. 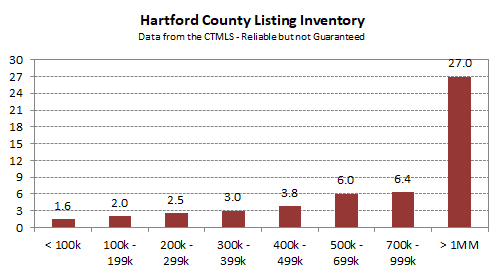 Here is what the County-wide inventory looked like as of year end. The vertical axis in the chart is “months.” The height of the bar for each price band indicates the number of months it would take to sell all of the current listings at the pace of deals for that price band over the past year. For example, there were 1,432 contracts signed over the past 12 months for homes with asking prices in the $300,000s. That translated to an average of 119 deals/month, so it should take about 3 months for the 362 listings currently available in that price band to find a buyer. What I want to highlight is that inventory levels are lowest at the lowest price points, and steadily increase as the price point increases. This trend has been evident for years and, when combined with the deal totals, shows that the real estate market is active and working properly in the lower price bands that make up the majority of Hartford County’s housing stock. As a point of reference, over 70% of the contracts in 2018 were for properties with asking prices of $299k or less. Since it is the end of the year, the next question we’ll investigate is related to pricing. How have prices changed during 2018? Look for an analysis of closed deals during the coming week. November exhibited the typical 4th quarter decline in activity, but outperformed November of 2017 by 4%. 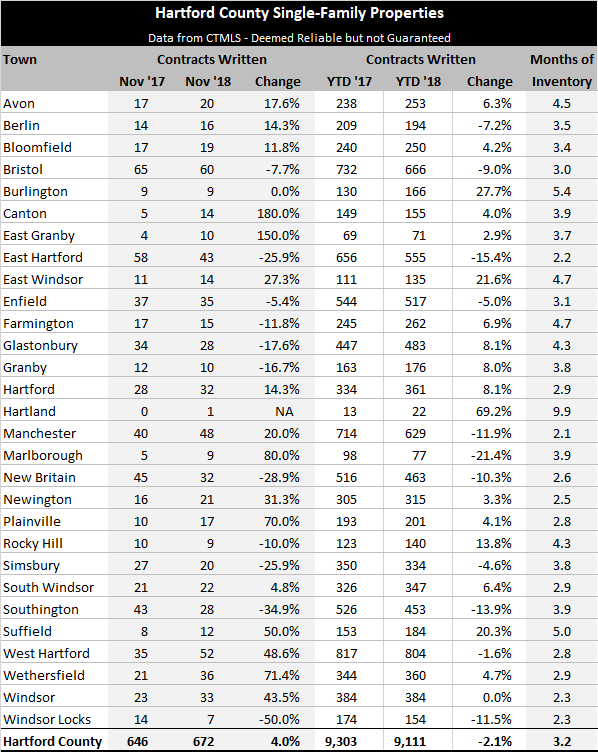 There were 672 single-family home contracts in Greater Hartford during the month, a number that was comparable to the September 2018 result. As we approach the year end, the chart at the top has basically finalized its shape. The months of June, July, August, and September feel out of line. It’s not that we’re questioning the data, rather we’re observing that those four months do not smoothly connect the May and October data points like they do in some years. The reasons behind the abrupt market change are, unfortunately, not a mystery that we are likely to solve. We neither predicted the change, nor were able to explain it as it happened. Even now, a few months removed, hindsight has not provided any additional information. No single factor has emerged as the defining narrative for the summer months. As always, we prefer to acknowledge the uncertainty and factor it into our thinking rather than pretend to be able to explain it. Even though the year isn’t quite over, we’ve begun the planning process for 2019. We’re looking forward to another active year in the real estate markets. How can we help you with your real estate goals? September was a down month for the Hartford County single-family market. The number of contracts signed declined more than 9% from the same month last year, leaving the County 4% behind on a year-to-date basis. It appears that there will be a modest fall market in Hartford County this year. Other agents throughout the state are reporting similar observations about the market, so the deceleration does not appear to be unique to Greater Hartford. I’ve heard a number of competing theories as to why we had a slow September, but it’s unfortunately impossible to know for sure why the number of deals moved downward this month. We cannot say for certain whether it is the local economy, rising mortgage interest rates, Connecticut’s political and economic situation, the national political environment, or something else entirely. Most likely it is a combination of many factors. Ironically, this may be an excellent opportunity for buyers to step in and find their new home. Let us know if you are considering a home search. We are always happy to talk real estate!